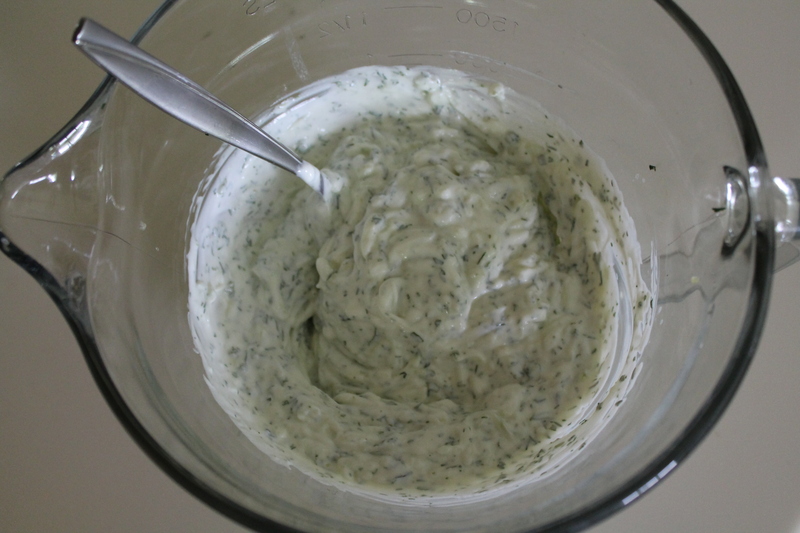 Tzatziki is best made ahead of time, to give the garlic and herbs more time to infuse the yogurt with flavor. Shred the cucumber, either by running it through the food processor (which I did) or by grating it on the large holes of a box grater. Toss the cucumber shreds with salt, then set them in a fine-mesh sieve over a medium bowl to drain. 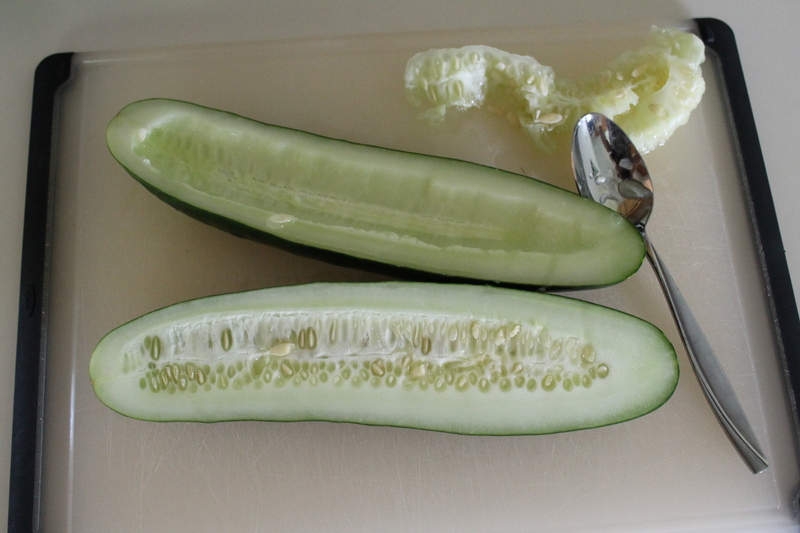 The salt will cause the cucumber to release most of its liquid. Let the cucumber sit for 30 minutes, turning a few times with your hands. 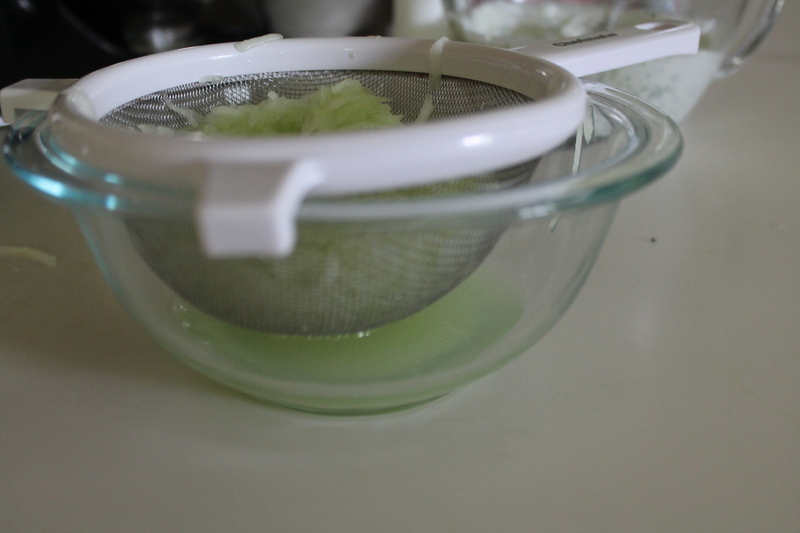 After 30 minutes, squeeze the cucumber shreds with your hands to get rid of most of the excess liquid. Stir together the shredded cucumber, Greek yogurt, garlic, olive oil, and herbs. You can change the ratio of the herbs to suit you: I used more dill than mint, probably something like 3 tbsp. finely chopped dill and 2 tbsp. finely chopped mint. Normally I don’t like dill too much, but it is just perfect in tzatziki! Taste and season with salt as needed. I used just a light sprinkle, probably around ⅛ tsp., and that was plenty! Cover and refrigerate for at least 4 hours to allow the garlic and herbs to really flavor the yogurt. Yum! You can use tzatziki on these gyros or simply as a veggie dip. When you are ready to eat, pull out the veggies. 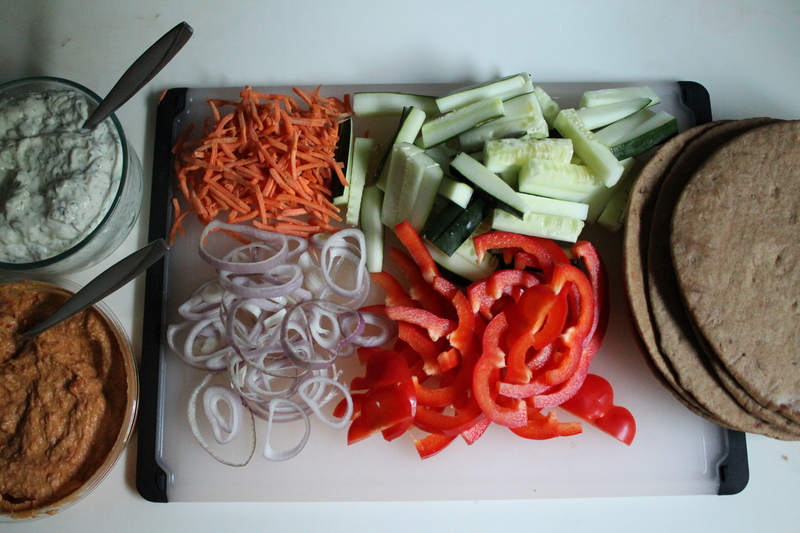 Quickly cut the cucumbers into sticks (in retrospect, I wish I had peeled mine first, as the skins were quite tough), shred the carrot, and thinly slice the red bell pepper and onion. I actually used a shallot, because I realized too late that I’d already used my red onion in something else. The shallot was just fine, but I would have preferred the sharper bite of the onion! Top with veggies in whatever order or quantity you’d like. Generously spread with tzatziki. And voilà! Make the tzatziki at least 4 hours before serving. Coarsely shred the cucumber in a food processor or on a box grater. Combine the cucumber shreds with 1 tsp. salt in a colander. Let them drain for 30 minutes, turning occasionally. 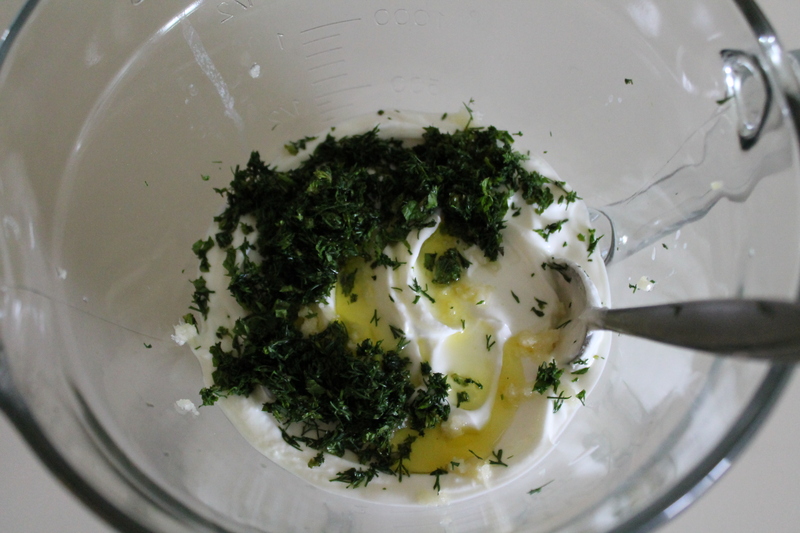 Meanwhile, mix together the yogurt, garlic, herbs, and olive oil. When the cucumber has released most of its liquid, squeeze it in a dish towel to get out the remaining excess liquid. Stir the limp shreds into the yogurt mixture. Season lightly with salt. Chill for 4 hours. Assemble the gyros. 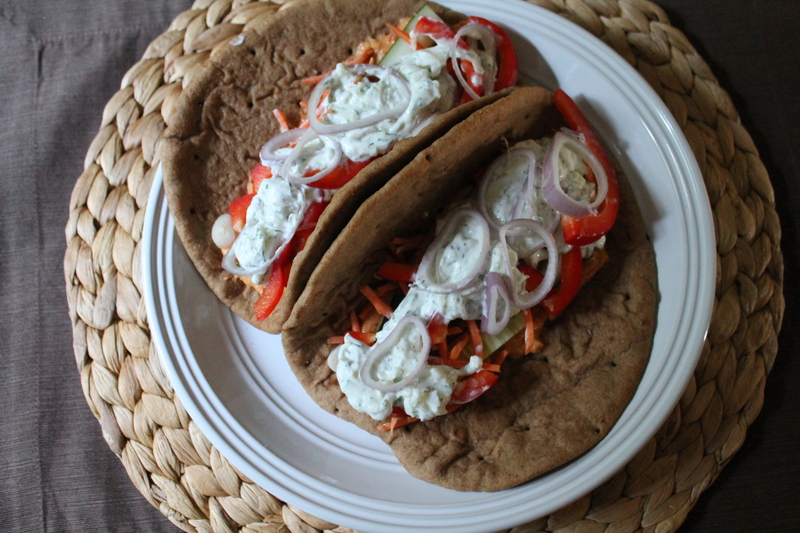 Layer hummus and veggies in the center of the pita round. Top with tzatziki to taste. Chop those lovely cucumbers up, freeze them and use instead of ice in a smoothie. Yes, I said smoothie. And try baking fish with the tzatziki in a thick layer on top. Got rave reviews from both men here. Ooh, interesting idea for fish! 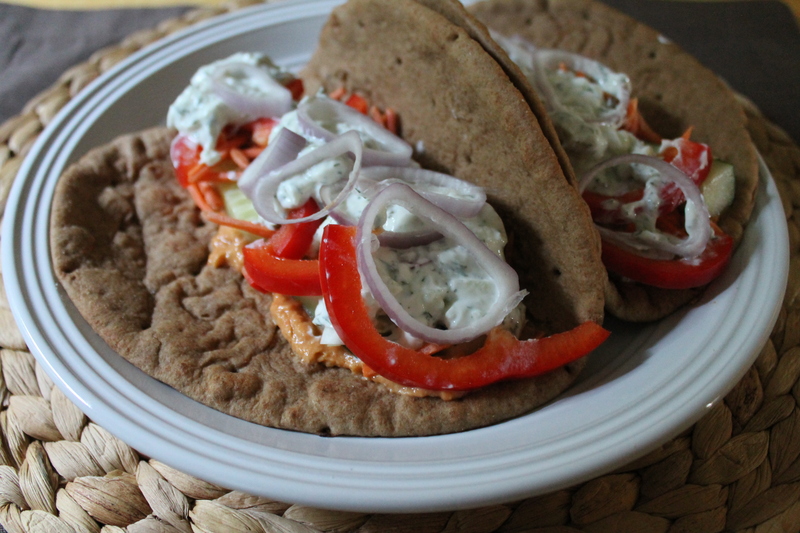 Dave generally hates fish, but he loves tzatziki…I think I will give that a go!